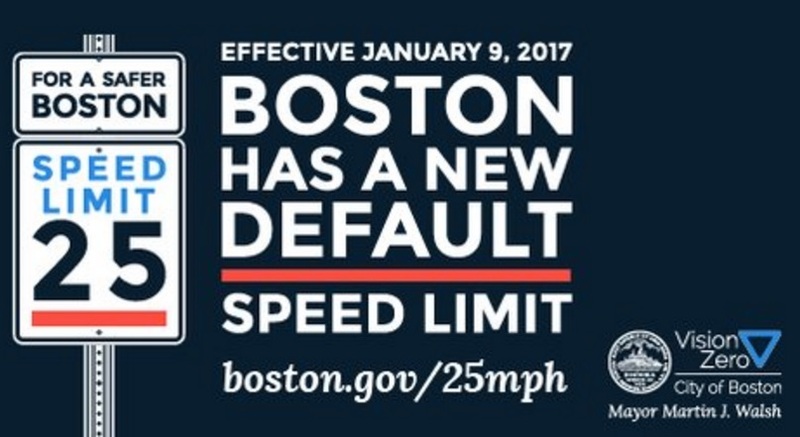 Boston, Nov. 30, 2016, — Mayor Martin J. Walsh today announced that the default speed limit on City of Boston streets will be reduced from 30 mph to 25 mph effective January 9, 2017. Thanks to the combined efforts of the Mayor, Boston City Council, Governor Baker, MassDOT and Massachusetts State Legislature this change will improve roadway safety for people walking, driving, and bicycling on city streets. State owned roadways located in the City of Boston will not be affected by this new law. Visit boston.gov/25mph to learn how to show your support and get engaged. This summer, Governor Charlie Baker signed a law giving cities and towns across the Commonwealth the authority to reduce the default speed limit to 25 mph. Today, the Boston City Council took a final vote approving Mayor Walsh’s petition to reduce Boston’s speed limit based on the new state law. This is an important milestone in our Vision Zero efforts of bringing the number of traffic-related deaths to zero, and with approval of this petition we are one step closer to achieving that goal. As of January 9, unless otherwise posted, the speed limit on all City of Boston roadways will be 25 mph. Boston Transportation Department teams are auditing existing speed limit signs, and will fabricate new signs as necessary. 25 mph speed limit signs will be posted at entrance points and other strategic locations in the City. Although a significant number of improvements have been made to Boston’s streets in recent years, traffic related tragedies continue to persist. To date in 2016, at least 17 people have been killed in traffic crashes on City of Boston streets. Twelve of these people were killed while walking and five were killed while in a motor vehicle. Slower speeds will help decrease these numbers, saving lives and preventing injuries. Studies show that there is a direct link between the speed that a vehicle is traveling when a crash occurs and the likelihood of a fatality or severe injury resulting from that crash. At 20 mph there is a 17% likelihood of a fatality or severe injury occurring, and that number jumps to 79% at 40 mph. The City of Boston expects that reducing Boston’s default speed limit to 25 mph will help in the City’s effort to prioritize safety and reach the City of Boston’s Vision Zero goal to eliminate serious and fatal crashes on Boston’s streets by 2030.